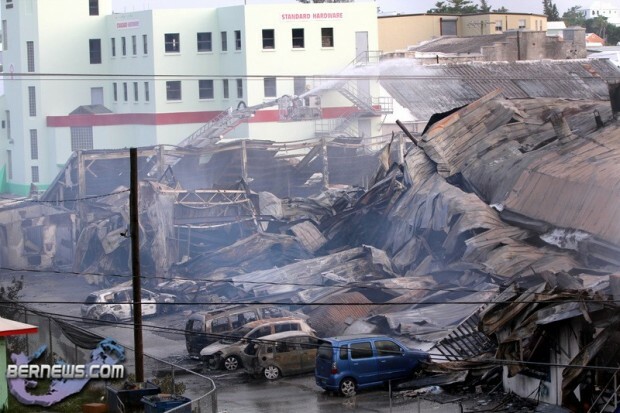 HWP released a statement this evening [Aug.8] following the massive fire that saw their St Johns Road facility destroyed. At approximately 2pm flames started tearing through the building, and dozens of firefighters and police responded to the scene, spending over three hours to extinguish the blaze. The photo below depicts HWP this evening after the fire. At around 2:00pm today (8th August), a fire broke out in the HWP Group Body & Paint Centre on St. John’s Road. The building is also home to the cycle sales division automotive showrooms, and administrative offices. The body and paint facilities, administrative infrastructure, computer, e-mail and telephone systems have been destroyed. Jonathan Brewin, President & CEO, HWP Group commented,“Our first priority was the safety of all staff and customers and we are pleased to report that our evacuation procedure ran smoothly. “After the safety of our staff and customers – our immediate priority is to ensure that customers who have vehicles being worked on are informed as to the status of their vehicles. Don Mackenzie, Chairman, HWP Group added, “We are working towards to resuming normal business as soon as possible, please bear with us as we do so. Looking after our team and resolving immediate customer issues is our top priority at this time. We appreciate the support of customers and colleagues who have already reached out to us”. Wishing HWP, STAFF AND FAMILIES A SPEEDIE RETURN TO WORK ! I think I may have owed you fellows some money . Any chance that bill survived the fire ? It says computer systems were destroyed so I’m guessing if YOU don’t tell them then perhaps they won’t know!! Good for you! A terrible loss and I feel sorry for you as you’ve a lot of work on your hands. Could you comment though about those cars on the South side of St John’s Road….why were they not moved? It seems from the many videos available that there quite a time-lapse between the outbreak of the fire and the time that fire came through to the South side of the building. maybe cause the keys where inside the bldg? In the interest of safety perhaps, Paul? How about letting the management do their jobs, and leave the commentary and speculation aside. So many on this site are such cynics – sad really. My thoughts are with the owners & employees of HWP, their affected customers, and most importantly the area residents that were affected by this horrible fire. Hats off to the fire fighters too – a noble job indeed. Hey bie, perhaps the more important task at hand was safeguarding the staff and customers! Cars can and will be replaced, THAT is what insurance is for. Keep your eye on the ball mate. Let’s hope so! HWP has a waiver that is signed saying any car left on their property is not their responsibility!! Cars can be replaced, but it may be at the owners expense! I know this because when my car was left there for repairs, while there it was broken into overnight… none of what was stolen was replaced by HWP or their insurance. Just imagine the poor site that has their car being sprayed to be passed by TCD, and might not have their own insurance active at that moment?! Obviously you are un aware of the dangers of a fire this large fueled by paint and gasoline. Wow. I Am impressed that they were able to evacuate all the people and keep them safe! Insurance will cover the material objects! Oh dear, oh dear, oh dear Paul — it appears you’ve never been in a fire. I have. The primary concern is evacuating all the living beings from danger. The second is controlling the fire before it worsens — think of what chemicals were in that building! There could have been a huge explosion that spread the fire to other buildings and killed or hurt others outside HWP. And third is putting out the fire. Your question may be genuinely naiive, but there’s no way of knowing how much time there was to think about those cars, nor if the police and firefighters would have allowed anyone near the scene to move them. For safety’s sake all the professionals would be concerned with is the potential of an explosion. And if you’re thinking about the cars being moved in before it became a blaze, no one — no one — knows how long it takes for a small fire to engulf a building so again, the professionals protect the safety of life first. Paul, nobody knew if the building was going to blow – or collapse. True there was a VW parked on the corner that could easily have been saved – but we only know that now. Would you have walked up to it and driven it away? The building could have collapsed on top of you at any minute. Granted it didn’t – but it could have. Safety first. Most businesses should, and do, have a system in place in case of fire. (I think that by law they have to). Always ensure that peopled are cleared from the building, no doubt about that. Never endanger yourself, no doubt about that. Keys for those cars are presumably kept in a box at reception. Was there a plan, if personnel are safe, to take the box and then move the cars out in the lot? I remember members of the public a few years ago bravely moving buses out of harm’s way during the fire at the bus depot in Somerset. Are we saying that current health and safety regulations would mean that those buses would be left? If we are all so worried about walls blowing out, and down, and gasoline exploding, why on earth were members of the public allowed to watch from a gas station about 30 feet from those parked cars? Lighten up Paul or are you worried about your BF&M shares??? BF & M? Thank goodness. I thought it was Argus! Look….everyone got out, that IS great. When you see a large fire in the US, Canada, China…do you think that as long as everyone gets out alive, that’s it? This is a serious business. An accident for sure or they would not be tearing the building down. But there are questions that have to be asked. Questions the insurance company (yes, as much as you don’t appear to like it…funded partially by shareholders and partially by premium payers like you and me). Was this accident preventable….was everything done to prevent further loss at the time the alarm was first sounded? Was data stored off-site, was everything done to move cars that could be moved. Unfortunately insurance matters have to do with other issues in addition to life. That’s why the fire department and insurance companies have investigators. There are questions to be asked after every accident, and this is an expensive one. And I have no shares at BF & M or Argus. I understand from someone on site at the time that management wanted to move the cars but were not allowed by Fire Service personnel. I personally would not have wanted to be anywhere near the facility given the amount of paint and solvents that must have been inside. The potential for explosion was very real. My hats off to Fire Service personnel who were risking their lives yesterday! To those folks standing across the street at the gas station: SMH!!! What a risk you were taking! If the gasoline had caught fire, there would have been no way to save you. AT LAST…..all I wanted to hear!! The fire department (or the police) did not want to have the cars moved because of the danger, yet they allowed those folks to watch from the gas station just 30 feet away. I’m baffled that people are still on here wondering about why the lives of the PRECIOUS CARS weren’t saved! What insensitive HWP workers – thinking of their own safety and not that of the cars! PLEASE just be thankful that all the humans made it out ok. That no onlookers or firefighters, police, etc. were injured. We have so much to be grateful for – CARS CAN BE REPLACED. Not holding my breath as to how quickly our Planning Department would move on any application to rebuild!!! They are usually completely out of touch when it comes to lives and costs being affected by their inability to process applications in a timely manner. This fire had better not be a problem that was caused by HWP and/or the negligence of its staff. If this was something that could have been prevented, or any advice from the insurance company prior to this not adhered to, it would affect an insurance payout. The insurance adjusters are going to really have a good look at this-trust me. HWP had better have all their ducks in a row for their sake. are you missing an S?? I hope there is an insurance policy or something that can take care of the staff who in these times cannot afford to be out of work. Good luck to you all and God speed. I am also wondering with a building with so much flammable material in it what type of fire suppressing system did it have? Hmmm! I would think a company as large as HWP would have business interuption insurance, which would afford compensation to employees in the event of such events that the company cannot be open. How far that extends is up to how much insurance was purchased. So so glad all of you are ok. We can replace the cars or computers but your lives are more important. Great job to everyone involved. why cant you have a heart? LMAO!! It was funny but glad no one was hurt. @ In general… if you look at the one of the videos you will see some type of material being thrown over to Dandy Town Trash containers along with a boom sound so the immediate area was not safe of anyone not even the Fire fighters. It is amazing no one was hurt. God was with everyone I am sure. I think that is what i was saying. A fire that size in unpredictable – AND when you start a car you are actually creating an “ignition” therefore by trying to move the cars would have put whoever was in them at danger. It is amazing noone was hurt! Now let the rebuilding begin. My Son and I worked for HWP Grop for many years. We offer our thanks to God that all Staff are safe. Your mothers would be elated to see what you have become. I hope nothing like this ever happens to you, and should it strike you area I hope you a the financial resources to sastain the unemployed period! Your english teacher would sh!t his pants if he read ‘ur’ comment. Great job to the fireman who bravely and tirelessly worked to put the fire out. So Glad absolutely no one was hurt. Things can be replaced. People can’t. We Love you #87. Bda Fire and Rescue. Remember your days in school? Fire drill means drop what your doing and exit in an orderly manner, not to save anything but yourself. Excellent response from HWP in a crisis. GRACE: thank God for that strong wind to blow the smoke / fire (although it was contained in the building) AWAY from the gas station across the street! That would’ve been a HOT mess! Sounds like Karma after charging people 900% more than they should for every service and part. Karma indeed. Not only that, maybe just maybe, the staff will appreciate their jobs now and treat customers better.